Nitric oxide (NO) is an important biological regulator involved in numbers of physiological and pathological processes. Altered NO production is implicated in various immunological, cardiovascular, neurodegenerative and inflammatory diseases. As a free radical, NO is rapidly oxidized and there is relatively low concentrations of NO existing in vivo. It has been challenging to detect and understand the role of NO in biological systems. 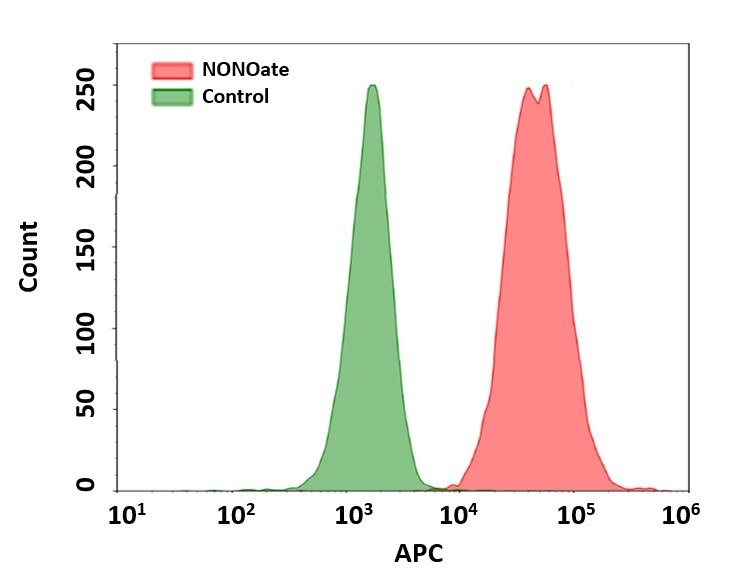 Cell Meter™ Fluorimetric Intracellular Nitric Oxide Assay Kits provide sensitive tools to monitor intracellular NO level in live cells. Nitrixyte™ probes are developed and used in our assay kits as an excellent replacement for DAF-2 for the detection and imaging of free NO in cells. Compared to the commonly used DAF-2 probe, Nitrixyte™ probes have better photostability and enhanced cell permeability. This particular kit uses Nitrixyte™ NIR that can react with NO to generate strong near-infrared (NIR) fluorescence signal. Nitrixyte™ NIR can be readily loaded into live cells, and its fluorescence signal can be conveniently monitored using the filter set of Cy5® or APC. This kit is optimized for flow cytometry applications. Add 200 uL of ddH2O into the vial of NONOate Positive Control (Component B) to make 50 mM NONOacte Positive Control treatment stock solution. Dilute 50 mM NONOate Positive Control treatment stock solution with Assay Buffer (Component C) to make 1-2 mM NONOate positive control working solution. For each sample, prepare cells in 0.5 mL warm medium or buffer of your choice at a density of 5×105 to 1×106 cells/mL. Note: Each cell line should be evaluated on an individual basis to determine the optimal cell density for NO induction. Add 1 µL of 500X Nitrixyte™ NIR (Component A) into 0.5 mL cell suspension. Note: For adherent cells, gently lift the cells with 0.5 mM EDTA to keep the cells intact, and wash the cells once with serum-containing media prior to incubation with Nitrixyte™ NIR. Incubate cells with test compounds and Nitrixyte™ NIR at 37 ºC for a desired period of time to generate endogenous or exogenous NO. Note: The appropriate incubation time depends on the individual cell type and test compound used. Optimize the incubation time for each experiment. Note: We have used Raw 264.7 cells incubated with Nitrixyte™ NIR working solution, 20 µg/mL of lipopolysaccharide (LPS) and 1 mM L-Arginine (L-Arg) in cell culture medium at 37 ºC for 16 hours. Spin down cells that have pre-incubated with Nitrixyte™ NIR for 30 minutes. Resuspend cells with 1 mM DEA NONOate positive control working solution, and incubate at 37 ºC for another 30 minutes. See Figure 1 for details. Monitor the fluorescence intensity at APC channel (Ex/Em = 640/675 nm) using a flow cytometer. Gate on the cells of interest, excluding debris. Figure 1. Detection of exogenous nitric oxide (NO) in Jurkat cells upon DEA NONOate treatment (NO donor) using Cell Meter™ Fluorimetric Intracellular Nitric Oxide (NO) Activity Assay Kit. Cells were incubated with Nitrixyte™ NIR for 30 minutes, and further treated with or without 1 mM DEA NONOate in Assay Buffer for 60 minutes. Fluorescence intensity was measured using ACEA NovoCyte flow cytometer in APC channel.